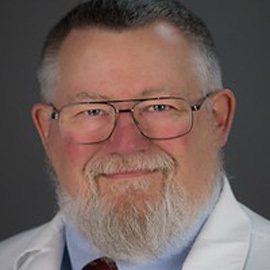 Dr. George joined the Wayne State University School of Medicine faculty in 1996, and he is Director of the Wayne State University Movement Disorders Center and also Director of the Movement Disorders Clinic at the John D. Dingell VA Medical Center. He is chairman of the Professional Advisory Board of the Michigan Parkinson's Foundation, and serves on the Movement Disorders Strategic Planning Committee of the American Academy of Neurology. He is Co-Director of the Neuropathophysiology curriculum for the Wayne State University School of Medicine. Dr. George's research interests include clinical management of Parkinson's disease, tremor and dystonia, and he has been active in clinical trials of new medications for Parkinson's disease and dystonia. He is also involved in research on measuring the impact of neurological disease on patient function. Dr. George's laboratory research has focused on neuronal reaction to injury and neural regeneration. Dr. George has a Ph.D. in pharmacology, as well as an M.D., from Case Western Reserve University, and was a Grass Fellow in Neurophysiology at the Marine Biological Laboratory in Woods Hole, MA. He has lectured and written extensively on movement disorders, and has served as a consultant to U.S. and international pharmaceutical firms. “Flex: An Open-Label, Non-Inferiority Study Evaluating the Efficacy and Safety of Two Injection Schedules of Xeomin (incobotulinumtoxin A) [Short Flex vs Long Flex] in Subjects with Cervical Dystonia with< 10 Weeks of Benefit from OnabotulinumtoxinA Treatment.” Sponsor: Merz Pharmaceuticals. Edwin George, PI, Mary Shaya, co-PI. “Effect of rasagiline (AzilectÒ) on Tissue Injury in Patients with Parkinson’s Disease: An Exploratory non-conventional multi-modal MRI study.” Sponsor: Teva Neuroscience. Omar Khan, PI, Edwin George, co-PI.